The New York Giants held their fourth summer training camp practice on Tuesday at Quest Diagnostics Training Center in East Rutherford, New Jersey. The New York Giants announced on Tuesday that they have signed place kicker Mike Nugent, who fills the roster void created when safety Jadar Johnson retired on Sunday. The 35-year old Nugent was originally drafted in the 2nd-round of the 2005 NFL Draft by the New York Jets. He has spent time with the Jets (2005-2008), Tampa Bay Buccaneers (2009), Arizona Cardinals (2009), and Cincinnati Bengals (2010-2016). Nugent was released by the Bengals in December 2016 after he had missed six extra points. He finished the season 23-of-29 (79.3 percent) on field goal attempts and is a career 80.8 percent on field goal attempts. Forty-four percent of his 2016 kickoffs resulted in touchbacks. Running back Shane Vereen (lower body soreness) and defensive end Devin Taylor (lower body soreness) did not practice. Wide receiver Dwayne Harris (shoulder) left practice early. Another sunny day, the heat was a bit more intense. First day in full pads and it was nice to both see and hear these guys run into each other, as silly as that sounds. Felt like real football although these guys are told to not bring each other to the ground. The first full contact I zeroed in on were run-game based. Half a line, 2 backs or 1 back/1 extra TE up against 2 DL and 2 LB. Defenders have a slight advantage knowing the run is coming, but the point of the drill was run blocking/filling lanes and simple assignments. Rookie UDFA Shane Smith stood out a few times against Jonathan Casillas. Delivered violent blows and knocked his man back a few steps. Impressive presence, power, and technique. Casillas got the best of the other FB competing for a spot, Jacob Huesman, on a few occasions. OT Bobby Hart was impressive today, he’s come a long way with his technique and fundamentals. He has such a natural power presence coming from his lower body and his foot speed is more than good enough. Consistency in games is what needs to be seen there. 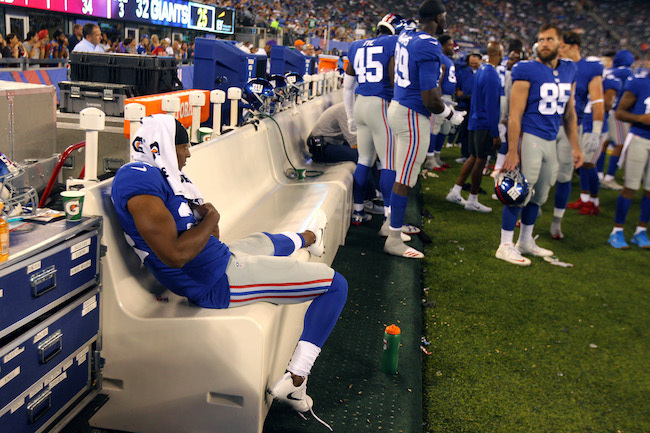 Ereck Flowers was bested by Olivier Vernon on a couple of occasions. The concern there is that Vernon is the kind of guy Flowers has always struggled against. Low to the ground, powerful, quick change of direction. Flowers just doesn’t look natural when he is moving laterally, the inconsistent techniques keep coming up. That said, he dominated DE Romeo Okwara more than once. When the action is in front of him and he gets his hands on, he is very effective. But there are still legit questions about his ability moving sideways. D.J. Fluker was fooled badly on a stunt where rookie DE Avery Moss shot inside. Fluker was late to recognize it and he simply doesn’t recover well. So top heavy. He was tested the same way a couple plays later and was ready for it. He is another guy with a really high level of hand strength and power. When he locks on, it’s over. The two rookie tackles, Adam Bisnowaty and Chad Wheeler, showed some warts that I had on them coming out of college. Bisnowaty (who also saw some snaps at RG) had a hard time sticking and anchoring to his man, while Wheeler didn’t get movement on his assignments Both are still showing their power presence isn’t ready for the NFL just yet. Tight end Jerell Adams showed excellent blocking technique and power. For a long guy, he sure does get his hips low with a strong punch. He sticks to his man and recovered well after being beat a couple times. He may be the best blocker outside of Rhett Ellison. That said, his movement skills look awkward and slow when he has to change direction. Little clumsy, tripping over his feet and double catching the ball. Quarterback Josh Johnson, for the 3rd practice in a row, outshine Geno Smith by a wide margin. Johnson throws such a smooth ball and it is almost always where it needs be. Smith still looks shaky in his new scheme. WR Kevin Snead is a guy I keep wanting to watch. You don’t see speed like this very often, he may be one of the fastest NYG has ever had. I would love to see one of the QBs air it out downfield to him in one of these scrimmages. His issue is the hands which is a major red flag. He was dropping more punts than he was catching. On the first O vs D play from scrimmage, linebacker B.J. Goodson proved what we talked about Sunday, he wants to HIT. He tossed wide receiver Sterling Shepard to the ground. Yes I do think it was on purpose. Shepard wasn’t happy about it but the scuffle was over shortly. DT Robert Thomas keeps getting the 1st-team looks next to Damon Harrison. He is a guy NYG fans will like. Hyper active, spark-plug-type guy. DT Dalvin Tomlinson looked a little overwhelmed at times. He had a hard time breaking away from D.J. Fluker. Tough guy to go against in straight-ahead drills though. LB Jonathan Casillas plays angry. He wants to be the most physical guy on the field and you have to love that. He and Goodson both have a way of sneaking underneath and through traffic to locate the ball on running plays. This LB group is fast and physical, a nice place to start. CB Eli Apple and CB Dominique Rodgers-Cromartie won most of their 1-on-1 battles today. They move with confidence and assurance. Defensive tackle Damon Harrison looks more and more like a young Vince Wilfork with each day that passes. He gives this scheme a lot of versatility and because of it; there may be some 3-4 looks. WR Sterling Shepard: He was getting some extra work in with Manning between sessions. Discussing when to turn his head around on certain routes. He was flawlessly fielding punts. He was getting off tight coverage with ease. And he was making catches away from his body routinely. His ball skills are among the best in the league and it looks like he is the kind of worker that wont stop trying to perfect his craft. S Landon Collins: Collins was a steady presence all day but a few things stood out to me today. While the entire team was on a “TV Timeout”, Collins was on the side field working with Spags on over-the-shoulder catches. Just him. After practice, we were in the field house waiting for about 30 minutes. The rest of the guys by that time are eating lunch but Collins comes strolling in from the field to fulfill his media duties still wearing his pads. The kid is a worker. I’ll say it again, he will be the leader of this defense. Rhett Ellison: I have a feeling this guy is going to be Mr. 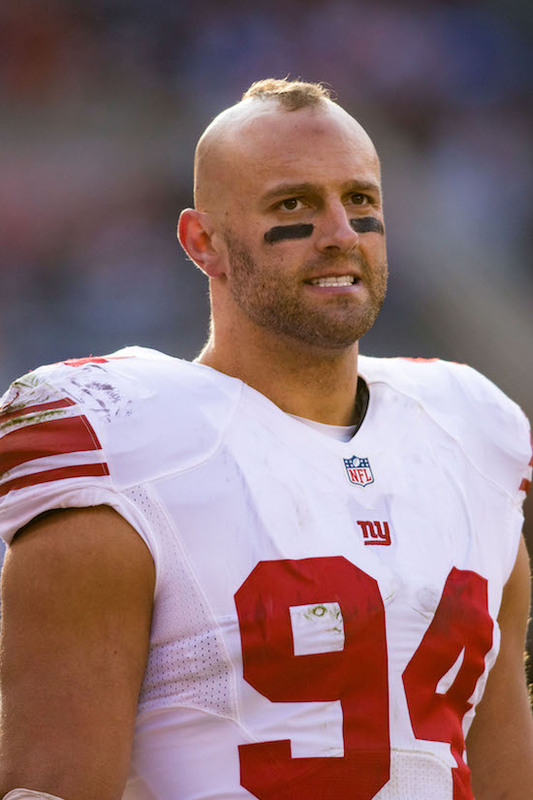 Dependable whether NYG needs a blocker on 3rd-and-2 or a pass catcher on 3rd-and-5. Ellison is as sure-handed as anyone I have seen here so far and the consistency he showed as a violent and sure blocker was nice to see. NYG could have really used a guy like this. And yes…Aldrick Rosas was perfect on his FG attempts. All of which were good by 15+ yards, including his 50 yarder. Another full pads day tomorrow, hoping to see some more secondary vs. wide receivers…as they were on the opposite end today. And tomorrow’s focus on the OL will be Weston Richburg, Justin Pugh, and John Jerry along with the interior backups. Below is the video report and interview with fullback Shane Smith. Place kicker Aldrick Rosas was 4-for-4 on field goal attempts, including kicks from 30, 37, 42, and 50 yards out. Giants continue to alternate Josh Johnson and Geno Smith at the #2 spot at quarterback. Today was Smith’s turn. 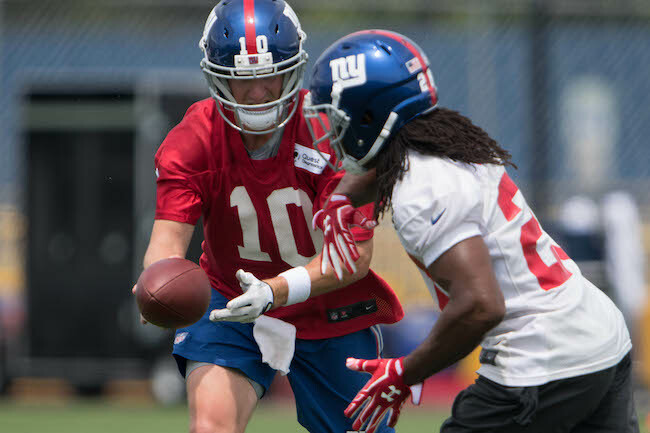 In 7-on-7 drills, cornerback Eli Apple knocked away an out-route pass from quarterback Eli Manning intended for wide receiver Odell Beckham, Jr.
Safety Nat Berhe defended a pass intended for tight end Evan Engram from quarterback Geno Smith. Smith then hit tight end Jerell Adams for a 20-yard gain. Wide receiver Brandon Marshall caught a pass over the middle from quarterback Eli Manning. Marshall then dropped a slant pass from Manning near the goal line. Wide receiver Travis Rudolph dropped a pass then made a diving reception from quarterback Josh Johnson. Quarterback Eli Manning hit wide receiver Sterling Shepard over the middle. Wide receiver Kevin Snead dropped 3-of-4 punt return attempts. Wide receiver Darius Powe was active catching the football in the team portion of practice. The fifth training camp practice will be held on Wednesday, starting at 10:55AM. The training camp schedule is available at Giants.com.